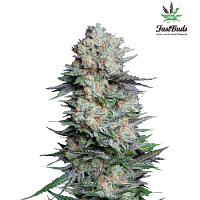 Blueberry Cheesecake Feminized Cannabis Seeds by Female Seeds: Our Blueberry Cheesecake (Cheese x Blueberry multiple hybrid) was selected from an extremely vigorous, smelly mother. We tried to recreate a very special phenotype we once found that had a really amazing Blueberry Cheesecake smell. And we succeeded! The Blueberry Cheesecake has two 2 phenos that only differ in appearance. 1 pheno is short and bushy (Indica look). This pheno will double in height from the beginning of the flowering stage. 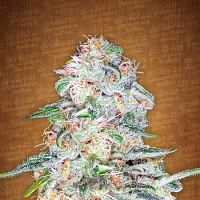 Pheno #2 tall thin shape (Sativa look) that will triple in height. 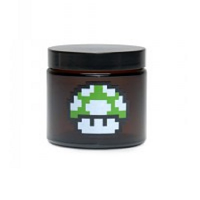 The plants are very resinous, giving healthy vigorous plants with a light blue shine. Flowers are known to be lime green and dark violet in color with orange hairs covered in a blanket of crystals. Really a big cropper with an amazing bag-appeal. 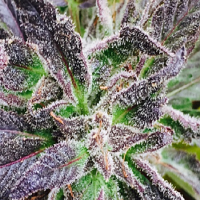 You will be amazed of the huge trichome production covering the buds from top to bottom. Perfect for outdoor in Mediterranean climates and for Charas production. Very intense and stinky smell in the flowering stage: carbon filter is highly recommended! The taste is fruit on inhale and cheese on exhale. Blueberry cheesecake is a great strain for putting mind and body at ease.